The raffle quilt is finished. 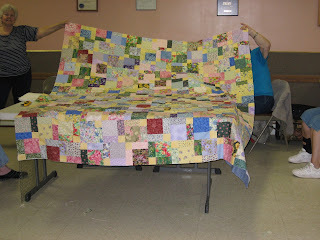 One picture shows a corner after the binding was sewn on. The other picture was taken Thursday after it was layered and tied and before the binding was applied. Now to sell lots of tickets. 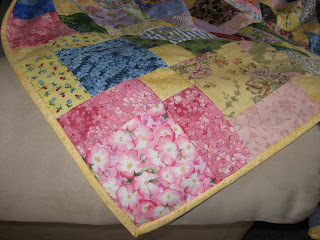 I couldn't think of a name for this quilt...maybe Garden Maze or Don't Step on the Posies. It's been another busy day finishing with my grandson Aaron's 21st birthday party. His birthday is on the 20th. Seems like it wasn't long ago since his 1st birthday party.